On Sunday, November 13, brush fires broke out at Harriman State Park. I first noticed it driving home on the Palisades Parkway after my hike in the Palisades at Ft. Lee. There was smoke coming off the mountain in the distance clearly visible where the highway descends off the Palisades escarpment. 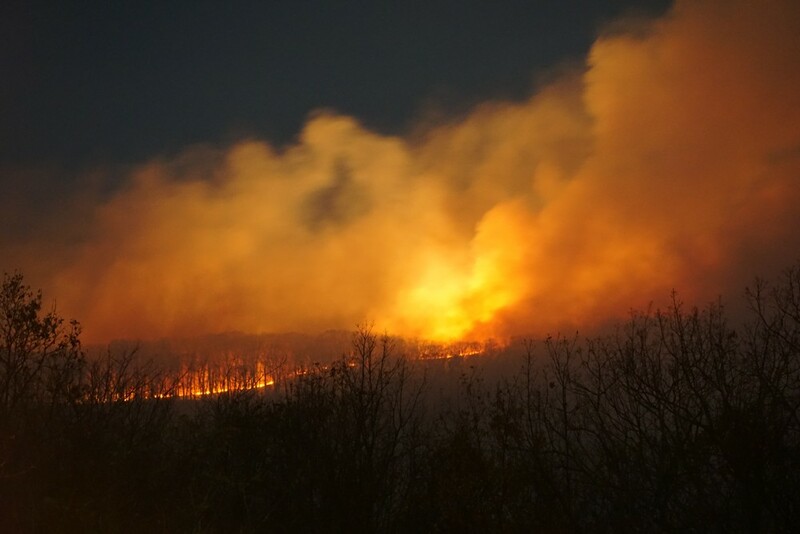 As dusk settled in, the flames were clearly visible on the top of the ridge from my area in Wesley Hills. It was very eerie seeing the line of flames atop the mountain. 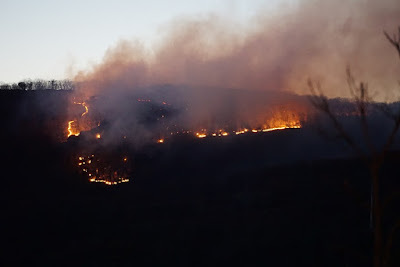 The fire area was contained mostly small fires, but it covered an extensive part of the mountain, from Catamount Mountain (at the area called "Hawk Cliff" on the new maps) to the notch between Catamount and Panther Mountains. 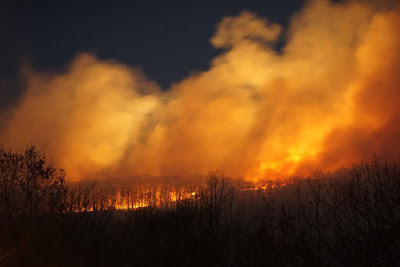 I came with my camera towards evening and photographed the fire at Ari Drive and Powder Horn Drive in Wesley Hills, which afforded an unobstructed view of the mountain. 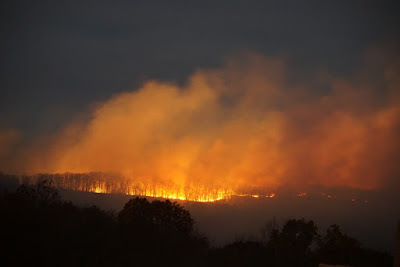 On Monday night, November 14, the area which had the fire the previous night was still smoldering, but the fires were out. 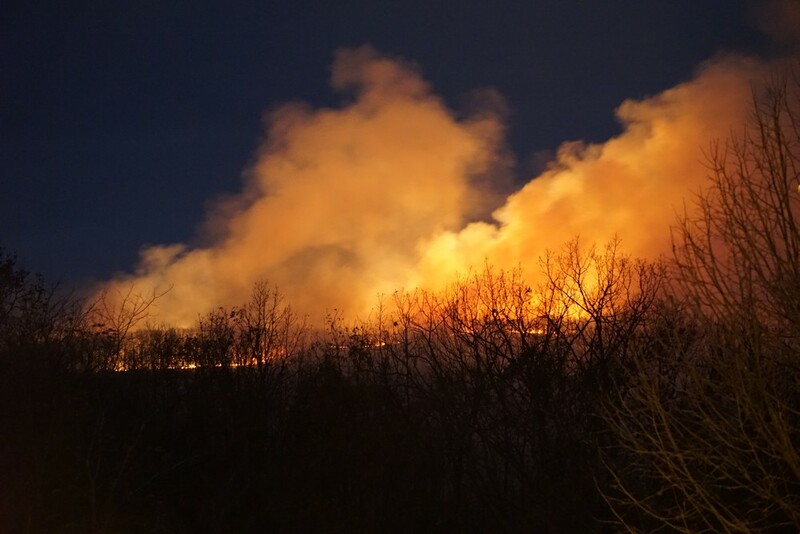 However, a fire with even larger flames was now burning atop Panther Mountain, from the area from the previous night all the way towards where the Tuxedo-Mt. Ivy Trail meets up with the Suffern-Bear Mountain Trail. This fire featured even larger flames and burnt zones than the fire the previous night. I came again to take pictures, from both Powder Horn Drive and Ari Drive, this time with my tripod and zoom lens for better pictures. The fire on the second night had clearly been an outgrowth of the fire of the previous night. Thankfully, the next day featured a soaking rain storm, with about an inch of rain. This effectively put out the fires, though there was still some additional smoldering after these rains. It wasn't until the weekend when another storm came, this one dumping several inches of snow on the mountain tops, that the fire was finally completely put out. The summer had been very dry, and fall was exceptionally dry, with very little rain. Given these circumstances, it is not surprising that the area was very vulnerable to the fires. However, I suspect that these fires were caused by arson, as its unlikely to have so many fires, including the one near Tom Jones Mountain, within the same time frame.